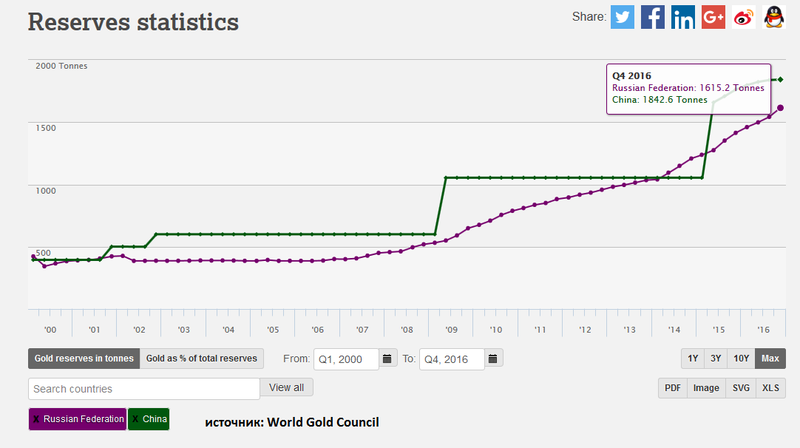 According to the quarterly report of the World Gold Council (World Gold Council, WGC), China and Russia are increasing their gold reserves. During the second quarter of 2017 the Bank of Russia added to its reserves 35.7 tons of gold and total gold purchases for the first six months of 2017 totaled 100.6 tonnes. General reserves of the Bank of Russia to the end of June reached 1,715 tonnes, ie. E. Accounted for nearly 17% of all foreign exchange reserves of the Central Bank. The graph shows that the Chinese and Russian central banks are actively buying gold last few years. Over the past ten years, China has increased its reserves from 600 tonnes in the second quarter of 2007 to 1,842.6 tons in the fourth quarter of 2016, and Russia with 406.9 tonnes to 1615.2 for the same period. It is assumed that in the future China will increase its gold reserves so that their share in total reserves is not very big - only 2.2%. Still, I want to note that the purchase of central banks account for only 10% of the total demand for gold (WGC data for the last ten years). Therefore, expect the central bank purchases significantly affect the price of gold, it is not necessary.